This Sunday is the Feast of the Holy Family; a solemnity established by Pope Benedict XV in 1921 because of the widespread breakdown of the family. 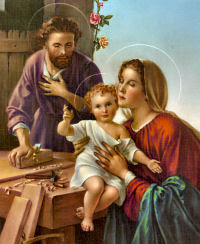 The emphasis was to hold up the family of Jesus, Mary and Joseph as the supreme example of Christian life. Could that be any less important today? Our first reading (Sirach 3:2-6, 12-14) can be summed up in six words - Honor thy father and thy mother. It is a prescription for love and respect within the family. God sets a father in honor over his children; a mother's authority he confirms over her sons. Whoever honors his father atones for sins, and preserves himself from them. When he prays, he is heard; he stores up riches who reveres his mother. Whoever honors his father is gladdened by children, and, when he prays, is heard. Whoever reveres his father will live a long life; he who obeys his father brings comfort to his mother. My son, take care of your father when he is old; grieve him not as long as he lives. Even if his mind fail, be considerate of him; revile him not all the days of his life; kindness to a father will not be forgotten, firmly planted against the debt of your sins - a house raised in justice to you. In our Gospel reading (Luke 2:22-40), we hear the beautiful canticle of Simeon, as Joseph and Mary fulfilled the religious law of presenting the first-born son to the Lord in the temple. Simeon, and the prophetess Anna, recognized the baby Jesus as the "Christ of the Lord", the Messiah. When the days were completed for their purification according to the law of Moses, They took him up to Jerusalem to present him to the Lord, just as it is written in the law of the Lord, Every male that opens the womb shall be consecrated to the Lord, and to offer the sacrifice of a pair of turtledoves or two young pigeons, in accordance with the dictate in the law of the Lord. Now there was a man in Jerusalem whose name was Simeon. This man was righteous and devout, awaiting the consolation of Israel, and the Holy Spirit was upon him. It had been revealed to him by the Holy Spirit that he should not see death before he had seen the Christ of the Lord. He came in the Spirit into the temple; and when the parents brought in the child Jesus to perform the custom of the law in regard to him, He took him into his arms and blessed God, saying: "Now, Master, you may let your servant go in peace, according to your word, for my eyes have seen your salvation, which you prepared in sight of all the peoples, a light for revelation to the Gentiles, and glory for your people Israel." The child's father and mother were amazed at what was said about him; and Simeon blessed them and said to Mary his mother, "Behold, this child is destined for the fall and rise of many in Israel, and to be a sign that will be contradicted -and you yourself a sword will pierce - so that the thoughts of many hearts may be revealed." There was also a prophetess, Anna, the daughter of Phanuel, of the tribe of Asher. She was advanced in years, having lived seven years with her husband after her marriage, and then as a widow until she was eighty-four. She never left the temple, but worshiped night and day with fasting and prayer. And coming forward at that very time, she gave thanks to God and spoke about the child to all who were awaiting the redemption of Jerusalem. In our Epistle reading (Colossians 3:12-21), St. Paul offers a lesson in the virtues that would thrive within a Christian family - "And over all these put on love." Brothers and sisters: Put on, as God's chosen ones, holy and beloved, heartfelt compassion, kindness, humility, gentleness, and patience, bearing with one another and forgiving one another, if one has a grievance against another; as the Lord has forgiven you, so must you also do. And over all these put on love, that is, the bond of perfection. And let the peace of Christ control your hearts, the peace into which you were also called in one body. And be thankful. Let the word of Christ dwell in you richly, as in all wisdom you teach and admonish one another, singing psalms, hymns, and spiritual songs with gratitude in your hearts to God. And whatever you do, in word or in deed, do everything in the name of the Lord Jesus, giving thanks to God the Father through him.